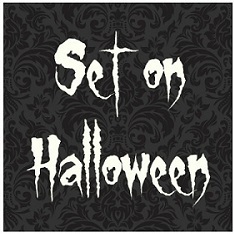 On Halloween night, eight trick-or-treaters gather at the haunted house by the edge of town, ready for adventure. But when Something whisks their friend Pip away, only one man can help the boys find him. Join the sinister Carapace Clavicle Moundshroud as he takes them on an unforgettable journey through space and time, deep into the mysteries of this spookiest of all nights. Can the boys save Pip before it's too late? First of all, it wasn't until about five chapters into the book that I realized that the name of the mysterious, scary big dude was "Moundshroud." As I was reading the book, I kept reading the name as "Moonshroud," because "Moundshroud" just felt like a mouthful. After that, the hardest part about reading this book was stumbling over Moundshroud's name... so I might have mentally switched back to the initial name I was mistakenly using. 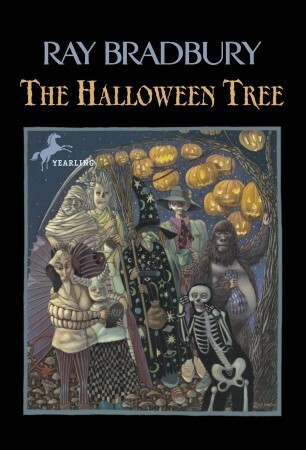 So apparently The Halloween Tree is the A Christmas Carol of the Halloween season. Sort of. It's a fantastical and ghostly adventure guided by strange Moundshroud that gives the readers and eight young boys a Reader's Digest history of the Halloween festivities starting from Egypt to England to Mexico, all while trying to find and save the boys' ninth friend, Pipkin, the Wonder Boy. The history lessons cover Osiris, Samhain, Grecian festivities, and even Dia de los Muertos (Day of the Dead). It's a very fast-paced, interesting adventure, and though I'm a little sheepish to admit that I got lost during some of the story, in truth, my mind totally wandered at some points. I'm almost wanting to say that the book was so fast-paced that I couldn't keep up with it very well. Still, it's a fun adventure, well-written, really, and something that I think many children would enjoy reading as part of the Halloween season. Myself... it really wasn't my cuppa, unfortunately.